On the morning of June 26th, only 13 trading days ago, we highlighted (click here to read that post) that the market had reached a point of correcting 1/3rd of its previous advance and had reached extreme oversold conditions that typically produce a rally. So here we are on July 15th, and abracadabra, the story is different. Today, we have a market that has changed from green to red and yellow. You can see what I'm talking about in the snapshot of our market internals below. Remember, 13 days ago, those dots were all green and smiling. 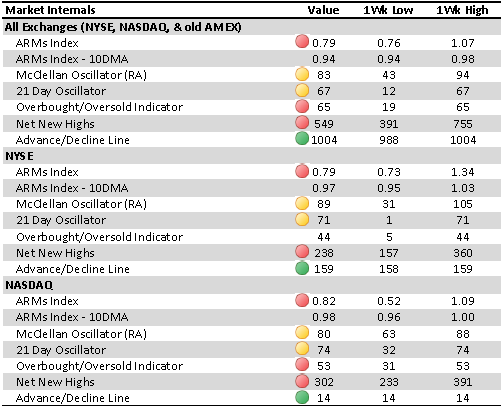 The only green buttons now are the advance/decline lines that are indeed showing nice upward trends. We mentioned last week (click here to read) how the NASDAQ Advance/Decline Line had changed its negative personality into a positive one since it started up in that low point of last October. That is good...especially for the long-term. Along these lines, let's look at one of our oscillators to see this recent transition. I'll be the first to tell you that the 21-Day Oscillator (orange line in above chart) that we use often as a short-term tool to gauge optimum buy spots, is not nearly as effective to gauge sell spots. Bull markets can keep these oscillators overbought for long periods. But in general, this current level does remove that "rubber band" bounce-back momentum that this rally has been depending on.